Ten years ago this month the U.S. Peace Corps agreed to send business educators to newly independent Ukraine. It was a historical event, marking the first time that the renowned volunteer troupe would venture into the former Soviet Union. Six months after the agreement was signed, the first batch of volunteers touched down in Ukraine to start 27 months of service in the new frontier. They were business educators who came to teach capitalism to former communists and learn how to live in a foreign land. "A good deal of my time was devoted to finding items like food, shampoo, shaving cream, aspirin and decent-tasting beer - instead of doing my job," said Mick Mullay, who served in the first group. Because the American Peace Corps staff was also inexperienced, volunteers were essentially on their own. "It was really up to the volunteers to create their own opportunities at their sites," Mullay said, who is now the country director at the Enhancement of Ukrainian Management Education in Kyiv, an educational program sponsored by the University of Minnesota. But times have changed for Peace Corps volunteers since 1992. Unlike earlier groups, volunteers are able to find more food and personal products. They also have access to computers and the Internet. The goals of the agency have changed, too. "Our initial aim in Ukraine was to expose free-market capitalism and break the stereotypes of Americans in general," said Donna Fiebelkorn, deputy director of Peace Corps in Ukraine. Today the goal of the agency is to support Ukraine's integration into the European Union, Fiebelkorn said. "We stand behind the integration, as long as that is what Ukraine wants," she added. Currently 170 volunteers are serving in 150 sites from Ternopil to Sevastopol. Their areas of expertise have expanded, too. In 1994, the agency began recruiting English teachers to work at schools, institutes and universities, and in 1997, the first group of environmental educators arrived. Fiebelkorn said that Peace Corps-Ukraine recognized that creating economic changes requires empowering civic organizations as well. "Our English volunteers not only teach in general-education curriculum schools, but conduct lessons on sexual health and HIV/AIDS." The Peace Corps was established in 1961 by U.S. President John F. Kennedy to allow American volunteers to help other nations become self-reliant. It is funded through appropriations from the U.S. Congress, and is non-political and non-sectarian. There are 7,000 Peace Corps volunteers currently serving in 70 countries around the world. Since the Peace Corps was founded, more than 165,000 volunteers have served in 135 countries. Peace Corps signs five-year contracts with the nations where volunteers are placed. At the end of the term, programs are re-evaluated and officials from both governments determine if Peace Corps should stay on for another five-year term. 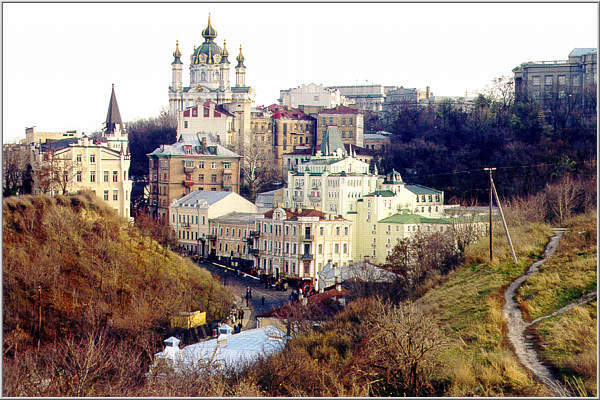 In Ukraine, Peace Corps has plans to stay at least until 2007. Volunteers served in Poland for 11 years before pulling out in June 2001. They were working in the Czech Republic and Hungary until 1997 before it was determined that the program was no longer needed. Russia has continued to host Peace Corps for the past 10 years. Fiebelkorn says that although Ukraine has come a long way in 10 years, there is still a need for volunteers, especially those working in the education and non-governmental sector. "Information about AIDS and problems concerning the environment still need to be taught," she said. Peace Corps Ukraine is not the same program it was a decade ago. It has been refined and retuned. In addition to new programs, Peace Corps has changed the way it trains volunteers. It has switched from training volunteers together in a central training center, to sending new recruits to villages for language and technical training. Volunteers are more isolated and, therefore, they must learn fast how to communicate and survive. "In this way, language, cultural, technical and other training are integrated through daily practice in an environment in which volunteers can discover and perfect their own opportunities for learning," Fiebelkorn said. Previously, Peace Corps sent groups of 30 to 60 volunteers to one city where they were all trained together. Peace Corps found that volunteers sent to villages and towns scored higher on Ukrainian and Russian language tests than those trained in large groups. And, so far, the dropout rate is at an all-time low. Only one of the 83 volunteers in the past two groups has quit. The average dropout rate had been between 10 percent and 15 percent. Volunteers seem to like the system, too. "Because we were in a small group, we had the opportunity to spend a good deal of time in the community and with our host families," said Charles Forbus, 66, a volunteer serving in Kyiv. Peace Corps is also changing the focus of service. In the past the organization put volunteers in all types of communities. Now they are going to small towns and villages, where there is greater need for assistance, Fiebelkorn said. "Smaller communities don't have as the same access to the technology and human capacity found in the West," she said. "We want to bridge the gap between the small towns who have and the large towns who do not." Great positive story about changes since 1992! As a member of the first group of PC English teachers I have one correction though: we arrived in 1993, not 1994, and the dropout rate for teachers (who were almost all sited outside the capital) was always far lower than that of business volunteers, who faced a different set of challenges and had a very hard go of promoting privatization in a country where the government was not behind such initiatives. Good to know the program is still welcome and adapting to in-country changes.